I think I may have gotten a bit over-zealous with the pumpkin pie spice. 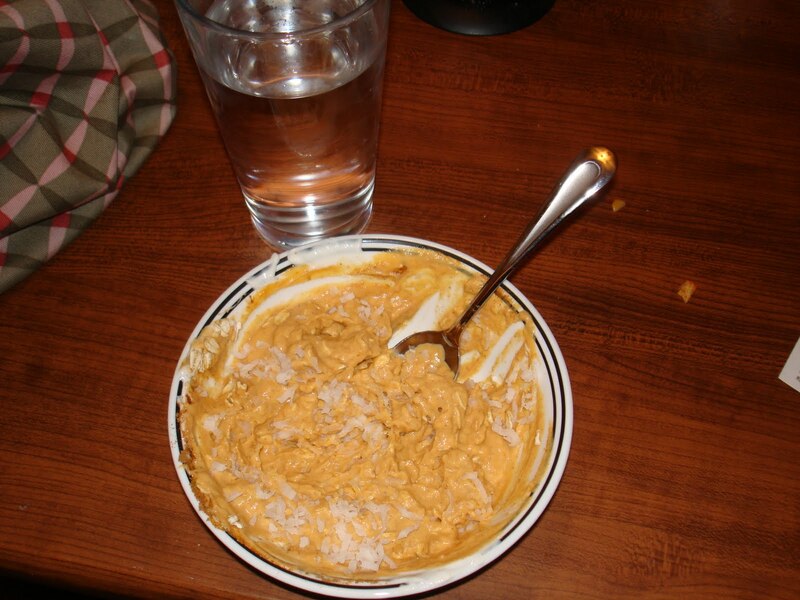 It wasn’t bad – it was good enough for me to eat half of it, but it definitely wasn’t great. Live and learn right? I’ll try it again adding the various ingredients slowly until I get a good flavor combo. I might also try plain yogurt instead of vanilla. I’m still getting used to combining flavors and finding things that work well together. Truly, this was my first attempt at putting something together on my own so I’m proud that it was at least edible. I can cook, but I’ve always been a follow the recipe kind of gal. I’ve also spent most of my life being INCREDIBLY picky when it comes to food. This has resulted in a pretty redundant meal repertoire. I’ve been so inspired by recently by the food blogs I’ve been reading (Healthy Tipping Point, Carrots n Cake, Oh She Glows), and other resources out there. I’ve got such a strong desire to expand my horizons when it comes to cooking and eating now. Maybe I jumped in head first a little too soon. Oh well, like most things, this is guaranteed to be a learning experience. 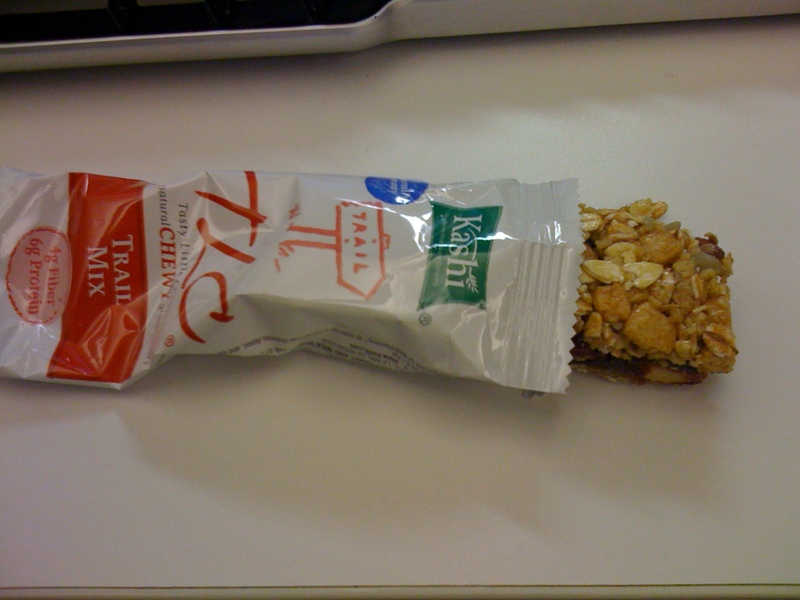 My morning snack today was my old standby Kashi Trail Mix Chewy Bar. I do love me some Kashi products. We split the BBQ Chicken Flatbread Pizza (my choice, but I compromised on the regular crust instead of the 5 grain, whole wheat they offer) which was also phenomenal. Again, I didn’t get a picture before we dug in, but here’s what it looked like re-heated on my plate for lunch today. I’m sure you can imagine how amazing it must have looked fresh on the table. When I got home, I looked up the calories online to assess just how much damage I had done, and I was pleasantly surprised. 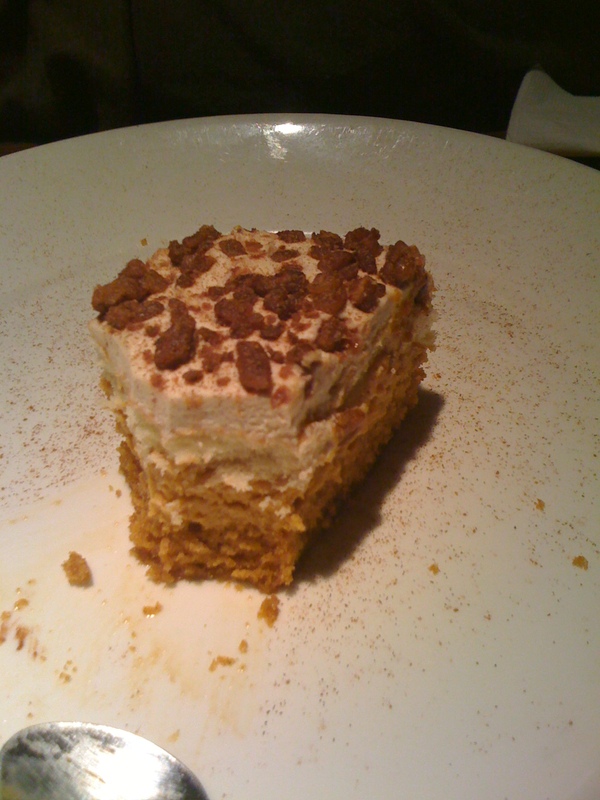 The dessert was two servings and each serving clocked in at 390 calories. Yes, this is more than I usually eat at breakfast, but if you consider the fact that some restaurant desserts have an entire day’s worth of calories in them, 390 isn’t so bad. It was totally worth every single calorie. I’ve failed at blogging my food recently so here are some eats from the last couple days. This morning’s Kashi Trail Mix bar. 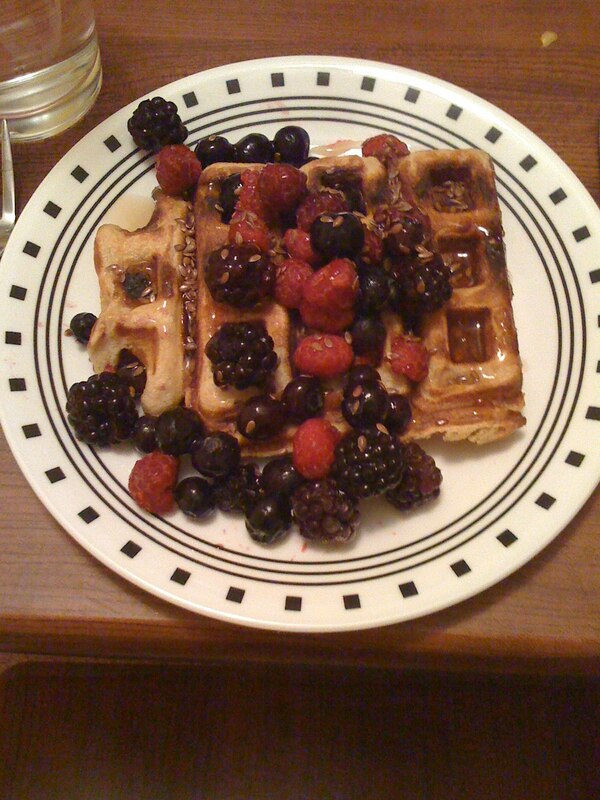 Wednesday’s breakfast – homemade toaster waffle with ¾ c. frozen mixed berries, 1T. light syrup and 1t. flaxseeds. 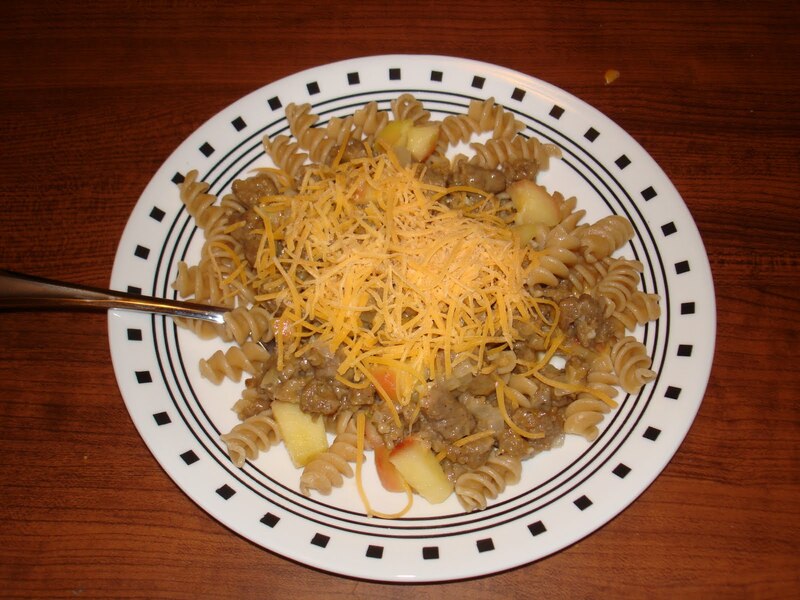 Wednesday’s dinner and Thursday’s lunch – Sausage and Apples on Whole Wheat Rotelle pasta. 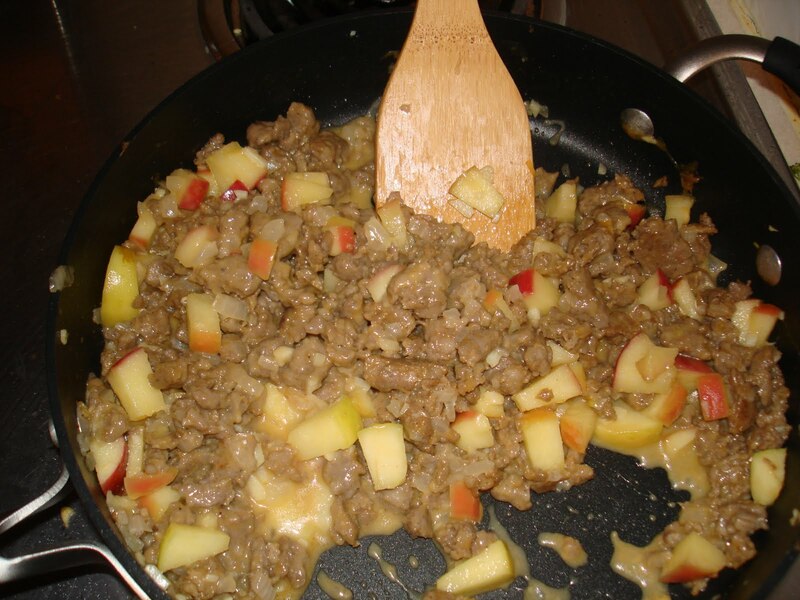 This is something my college roommate Emily and I created (mostly Emily) when we had an excess of apples and a tube of breakfast sausage in our apartment. The recipe is linked above. 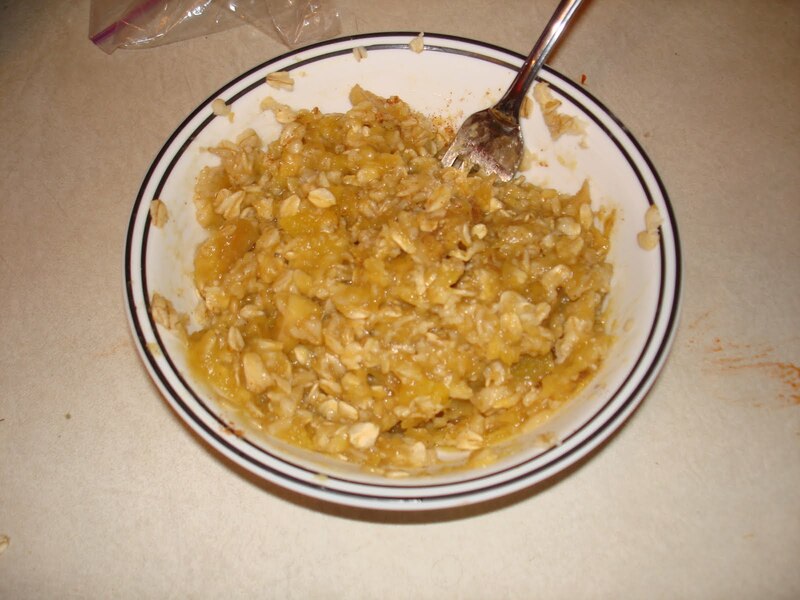 Thursday’s breakfast was inspired by Carrots n Cake – ½ c. oatmeal, ½ of a leftover baked apples and acorn squash. I have a 6 mile run on the indoor track planned for tonight. I’m hoping it goes well. I’ve had pretty solid runs so far this week, but I haven’t been able to break 4 miles since I ran 7 a couple weeks ago. 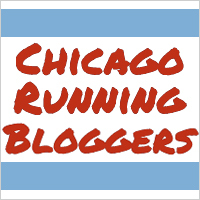 I’m hoping since my running funk seems to have lifted tonight’s run will be awesome. I’m going shopping this weekend. I’ve been holding out on buying dress pants, but Wednesday a co-worker said to me “I hate to break it to ya girl, but you really need to buy some new pants.” That’s the downside of living a healthy lifestyle and loosing weight. Your clothes get too big and you have to buy new ones. Okay, I suppose that’s really only a downside if, like me, you don’t have a lot of extra money to be spending on new cloths because you recently acquired yourself a mortgage. Anyway, back to the point, I plan on leaving a whole mess of Operation Beautiful notes on fitting room mirrors since I’m sure I’ll be trying on many things. I have a dinner like that tomorrow at a local chain called Not Your Average Joe's and I was surprised that they actually had nutritional info on the website. I'm planning now. I am AMAZED that some of the dishes that I thought would be the healthier choices (chicken, salmon) actually have more calories than others (steak, crabcakes). The biggest surprise was that a molten chocolate lava cake dessert without the ice cream is only 235 calories. I was shocked! I wish you an amazing run tonight. May your shoes be swift and your high school classmates be elsewhere!